Gareth Edwards is a name known mainly to British sport fans, but did you know there is also a rather talented gentleman in the world of film who shares this namesake, who is directing an upcoming blockbuster known as Godzilla? Well, you do now. And before the lucky bugger nabbed himself such an incredible job, he had worked on a $500,000 film of his own titled Monsters. Set in the near future where alien life has spread across the Earth, Monsters follows the story of a young man and woman attempting to cross the border from Mexico to America, traversing through the deadly infected zone in the process. Now allow me to elaborate a little on Edwards' story here; a NASA probe crashed to Earth many years ago, and alien life within it began to escape and reproduce. The running and screaming has since ended; now the monsters are residents of our planet, albeit dangerous ones. They're quarantined in vast areas of land known as the infected zone, which our protagonists Andrew Kaulder (Scoot McNairy) and Samantha Wynden (Whitney Able) must journey through to get home. As you can quite probably tell, the story is massive in scope, yet when watching the film you'll find it's so humble and subtle in execution. In order to tell such a large story, Edwards has employed a clever use of computer generated imagery to create the backgrounds of each scene - helicopters whizzing past, signs displaying the infected zone areas, and buildings destroyed in unseen attacks. His technical expertise are combined with a clever setup that allows us to be absorbed into the world around the characters without necessarily seeing much. This echoes classic monster movies such Spielberg's Jaws, where seeing so little of the monstrous antagonist actually created a stronger feeling of tension. The actors do a superb job and share an interesting chemistry, even if their romance seems a little underdeveloped. It's also amusing how so many of the extras perform so well despite a lot of them being random people the crew approached when filming on location. The spontaneity of the production benefits the final product in many ways like this, but also paves the way for inevitable problems; employing mostly natural light means the film is often a little too dark at times. Scenes set during the nighttime hours are barely visible which can create a sense of irritation just as much as it can create suspense. 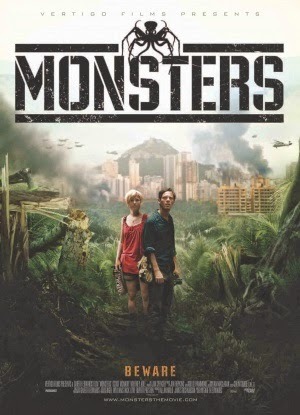 In spite of these few flaws, Monsters remains an entertaining and interesting low budget sci-fi story, and it's clear now that hiring Edwards to direct Godzilla was indeed the right choice.